It's safe to say that King Kong won't die in this weekend's monster epic Skull Island, as he's set to return in Godzilla Vs Kong before the end of this decade. 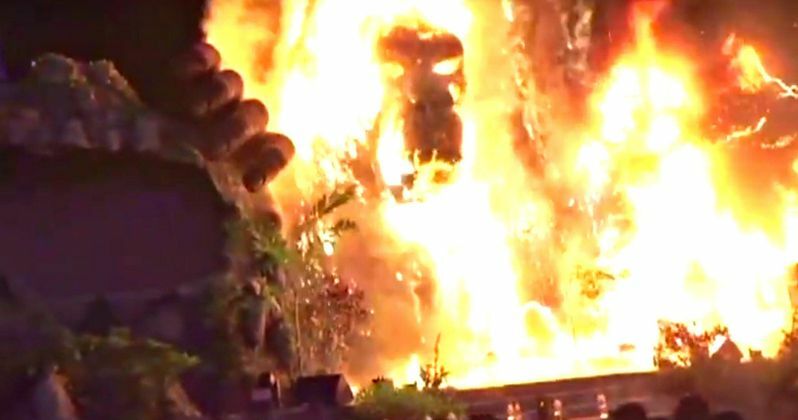 But new video from the recent Vietnam premiere for the movie is quite prothetic as a giant display of the ape goes up in flames. It is truly something to behold, and kind of funny. The video appeared on the AFP News Agency Youtube Channel. They say this about the video. "Film buffs with the hottest ticket in town were left running for safety after a giant model of King Kong went up in flames at the sizzling Vietnam premiere of the rebooted horror classic." True to fashion, King Kong has never fared well once he gets off Skull Island, and his trip to Vietnam proved to be just as dangerous as the journeys he's taken in the past. This model of King Kong once stood at 16 feet, and was created specifically for this Vietnam premiere. A lot of work went into its design and creation. But a discarded flaming torch brought it all burning down to the ground. Luckily someone was on hand to capture the spectacle in its all its ashy, smoke-filled glory. The premiere took place in Ho Chi Minh City, where a great deal of the human action seen in Skull Island was shot. The display was accompanied by a working volcano. The fire started when one of the fire dancers performing in front of the display lost control of their torch. Sky News reports that this ignited with the bigger flames coming from the volcano, which is responsibly for the giant standee's demise. Once on fire, there was no putting Kong out, and the whole thing burned to the ground within five minutes. Onlookers believed that the giant roaring fire was all part of the big promotion. But as soon as folks realized this wasn't planned, they began to flee the scene fearing for their lives. Firefighters arrived not soon after the fire was started and within 15 minutes, the scene was contained. No injures have been reported. Except Kong, who suffered some major burns he'll perhaps never recover from. Could this video be foreshadowing what we'll see in the Godzilla Vs Kong movie coming in 2020? While Godzilla is getting a proper sequel in 2018 with King of the Monsters, Kong hasn't been confirmed to return in his own sequel just yet. Will Godzilla be the victor? Or will it be a tie? Skull Island takes place in the 70s, during the Vietnam War, also another reason for this particular premiere setting. Kong: Skull Island fully immerses audiences in the mysterious and dangerous home of the king of the apes as a team of explorers ventures deep inside the treacherous, primordial island. Reviews have been positive, and it looks like it could beat Logan at the box office. Kong is in theaters, terrorizing audiences as we speak. Before you head out to catch the big ape on the big screen, watch as he goes up in flames.